The board of Manchester United is advising shareholders to accept the controversial takeover bid from US tycoon Malcolm Glazer. Mr Glazer currently owns around 76.2% of Manchester United's shares and is offering 300p a share for the rest. In a letter to shareholders, Man United Chairman, Sir Roy Gardner announced his impending resignation, along with that of non-execs Ian Much and Jim O'Neill. Mr Glazer is expected to delist the club's shares by 30 June. Such a move would end United's 14-year presence on the London Stock Exchange. In a statement, Man United's board said unless shareholders had "strong non-financial reasons" for holding onto shares, they should accept the offer. The board indicated it planned to sell its own shares to Mr Glazer and encouraged other investors to do the same. But Mr Gardner said Mr Glazer had failed to provide adequate guarantees over debt, ticket prices, player transfers and lack of interference with the selection of teams. With ownership of more than 75% of the club's shares, Mr Glazer is allowed offload his debt on to the club's books and take the club private. Many of the club's fans, including small shareholders, have been vehemently opposed to the US takeover on the grounds that the deal is based too heavily on loans and will saddle the club in debt, resulting in higher ticket prices. In total, members of fan group Shareholders United (SU) say they own about 15% of the club. But regardless of whether the remaining shareholders sell up or not United's time as a publicly-listed company is bound to come to an end. So shareholders are being encouraged by the board not to hold onto shares purely for sentimental reasons. Nevertheless, fans are determined to fight on and Shareholders United has already been in talks with lawyers about a "possible strategic sale" of a number of shares to Mr Glazer for the 300p offer price. 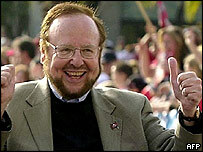 23 May 2005 - Glazer says he owns 76.21% of the club. It plans to put that money in a high interest account - the Phoenix fund. If the campaign to put a stranglehold on Manchester United's income is successful and Mr Glazer is forced out of the club, SU said it hopes to be in a position to buy back a sizeable share of the club. Shareholders United's latest move to hit the club's sponsors and plug Manchester United's revenue stream is to urge fans to terminate their mobile phone contracts with shirt sponsors Vodafone, and sign up to other networks. SU says it has struck a deal with two corporate communications firms which will net SU's campaign around £60 for each completed switch. "It's a win-win offer. United fans can put the squeeze on the parasitic Glazer whilst at the same time doing something positive by raising money for the 'Phoenix Fund'," said SU's vice-chairman Oliver Houston. Meanwhile, lawyers are also being consulted on the legality of Mr Glazer transferring his debt onto the club's books, SU said. Manchester United's legal status will have to be changed before Mr Glazer can use the club's assets as security for the money he is borrowing. Shareholders accounting for 5% or more of the shares can legally apply to a court to stop this. The offer to sell shares in the world's richest football club to Red Football - Mr Glazer's acquisition vehicle - is due to close at 1500 (1400 GMT) on 13 June. After that time, Mr Glazer says, he may not buy their shares any more, rendering remaining stock null and void and effectively worth little beyond its sentimental value.